Cazenovia College alumna Emma Voigt '12 participated in a mission trip to India in 2016. During this experience, she taught women—who are survivors of human trafficking—how to sew, with the intention that this skill would help them find employment. "Every once in a while, we experience a moment that makes everything that came before it make sense," comments Voigt. "When I started planning my trip to India in 2016, it felt like the event that so much else had been leading to." Voigt started her educational journey as a Fashion Design student, preparing herself for a career as a designer. On the first day of her freshman year, Dr. John Robert Greene made a comment in his First-Year Seminar that would stick with Voigt for the rest of her academic journey: "College is four years to think!" Cazenovia College provided Voigt with numerous mentors, who helped her find what was most important to her. Early on in Voigt's education, she attempted to pursue dual degrees in fashion design and the social sciences. Although she raised a few eyebrows, her faculty and staff mentors helped Voigt to explore her myriad interests. "When I decided to officially switch majors, my professors made sure that it did not hinder my plans to study abroad," comments Voigt. "Most importantly—whether in the classroom, gym, or cafeteria—there was always someone who made sure I was on the right path. This helped me learn that the experience is just as important as the outcome." Many people in the Caz community are important to Voigt; however, two are particularly important. "Dr. Greene prepared me for writing in graduate school, and debate with Professor Maureen Louis is the main reason I can speak in front of an audience. I could go on about the many individuals who had a huge impact on my life, because there is something about the community at Caz that made me believe in my own potential." Ultimately, Voigt decided to major in the social sciences and use her fashion design skills as more of a hobby. She became very interested in the topics of human trafficking and gender-based violence through her research. Voigt was not aware of it during her time as a student, but these interests led her to the path she is on now, which is teaching sewing to women in India. While still at Cazenovia College, another professor helped Voigt secure an internship with the Catholic Charities of Onondaga County's Refugee Resettlement program. 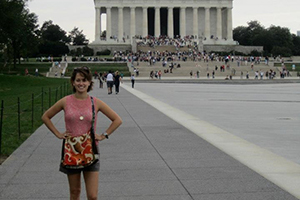 This internship provided Voigt with the opportunity to make friends with people from all over the world, and sparked her desire to live in Syracuse after graduation in May 2012. In order to support herself while continuing to work with a non-profit refugee assistance program, Hopeprint, Voigt accepted multiple part-time jobs. This helped her to build her resume and land a job with AmeriCorps VISTA (Volunteers in Service to America). While working for VISTA, she helped the Northside Urban Partnership (Northside UP) develop an entrepreneurship-training program. Voigt's research background, gained through her studies at Cazenovia College, helped her to build capacity at this organization. When her VISTA year ended, Voigt was looking for a way to stay in Syracuse. She used her connections to start a small sewing business and the refugee women she bonded with helped. Voigt used her entrepreneurial ambitions and knowledge of design from her brief stint as a fashion design student, as well as her skills in communications to promote her products in the area. Voigt shares, "We made handbags and other items from fabrics brought by refugee women from their homelands to sell in local shops. I intended to combine the diverse cultural fabrics of Syracuse's refugee community to create cohesive designs that told the story of our neighborhood often known as, 'Gateway to Many Nations.'" During that time, she also took a job in the International Services Office at Syracuse University to support her business endeavor. Her entrepreneurial activities took a back seat as she started to become more involved in her International Student Advisor role and began to pursue her master's degree. "A few of the seamstresses that I had worked with moved away, but I did continue to work on new sewing techniques. During this time, I gained experience teaching across language and cultural barriers," adds Voigt. "While pursing my master's, I continued to look for the intersection of my seemingly disjointed interests. I researched entrepreneurship in conflict-affected areas, international business laws, as well as the effect of conflicts on the fashion industry." In the fall of 2016, Voigt moved to Washington, D.C. and became involved with a local church (National Community Church) community. It was through the church that she decided to participate in her first mission trip to India. She shares, "It seemed like things were falling into place, and that everything else had been leading me to that cause." Most of Voigt's knowledge of India was derived from her research on population and poverty. Some of her friends that are from India also shared with her different things to expect. This knowledge prepared her for the worst, but what she soon realized was that you can only truly understand through personal experience. As they drove through the hints of sun in Pune, India, she felt at ease. For the next 10 days, Voigt would be working with Sparsh – an organization that provides holistic care for survivors of trafficking. About 24 children of trafficking victims lived at the Sparsh house, along with six women who had been rescued from trafficking. During the time the group spent there, Voigt would teach the six women how to sew messenger bags, which they might eventually be able to sell. "The women's eager determination and work ethic were inspiring. After preparing meals and cleaning the house, they would enthusiastically set up the sewing machine and start working," comments Voigt. "They would not let me help clean, but always brought me a cup of tea while I waited for them to finish their work. These were tasks they would have been forced to do as victims of trafficking, but now this was their way of showing love." There was only one sewing machine for the six women to share, so they often asked Voigt for extra hand sewing as they waited for their turn. Voigt was truly inspired by their work ethic. When the children would come in from playing outside, a few of the older girls would ask for fabric. They would practice simple stitches on scrap pieces of fabric. As Voigt went around to her students, she looked up to see some of the older children teaching the others the stitch she had just taught them. Each time they learned a new technique or skill, they would pass it on. Voigt shares, "Some of the women were scared of the speed of the sewing machine. One of the older children confidently jumped in to try it. Seeing her excitement and confidence made the other women more confident." During her time in India, Voigt realized that it was more than just sewing to the older children and women. It was an opportunity for them to practice their leadership skills. She adds, "When I learned how to sew, it helped me learn patience and problem solving. Each time you have to overcome a small glitch with the machine, or a mistake you have made, it is a reminder of what you can do for yourself. It strengthens your independence." Voigt plans to go back to India this fall to see the progress that her students have made. She also is planning to spend more time teaching sewing to women living in the slums of Pune, India. 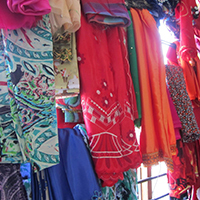 "Tailoring is still a common trade in India, so there is hope that these skills may help the women find employment," says Voigt. "Building off my experiences from last year, I would also like to share some of my knowledge of entrepreneurship when I return to India. These women and children feel like an extension of my family, and I am grateful for everything that prepared me for the experience." Voigt's story is an example of the success of the Cazenovia College alumni. To share your story with us, email cazsocial@cazenovia.edu.